Smart meters can help share the load of charging electric cars. This represents an increase of 5 percentage points from 2017, and a consistent increase in support for this statement over the past six years. It suggests that support for climate action in Australia is bouncing back towards its high point of 68% in the first set of Lowy Polls in 2006. According to the Lowy poll, which involved a nationally representative sample of 1,200 adults, 84% of Australians support the statement that “the government should focus on renewables, even if this means we may need to invest more in infrastructure to make the system more reliable”. Farmers stand to lose from any weakening of the government’s climate change policies. That is why farmers and their political representatives should be concerned about a current review of the government’s greenhouse gas reduction policy. What is at stake here is the strange-sounding idea of carbon farming. To explain this idea takes several steps, so bear with me. The policy under review is a legacy of the Abbott era. 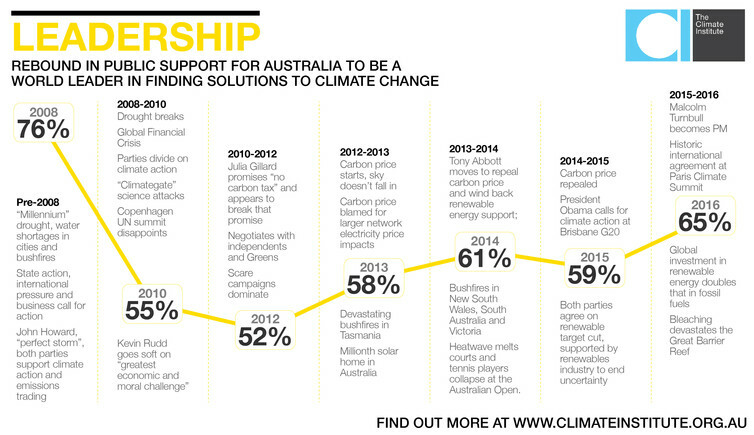 As prime minister, Tony Abbott abolished the carbon tax and replaced it with an Emissions Reduction Fund (ERF). The ERF was to be used to pay businesses to reduce their carbon emissions, or to capture and sequester (store) carbon dioxide already in the atmosphere. As it turns out, most of the funding has gone to rural enterprises that have developed various farming projects that qualify for funding – hence the term, carbon farming. capturing and destroying the methane from effluent waste at piggeries. How does carbon farming work? To make it all work, the government first created the system of Australian Carbon Credit Units (ACCUs). This system commodifies the outputs of carbon farming, so these can be traded. In this system, a carbon farmer must show either a reduction in emissions, or carbon sequestration (or ideally both), according to clearly specified criteria. The government will then issue (free of charge) one credit for every tonne of carbon dioxide (CO₂) – or CO₂ equivalent – abated in this way. Farmers can then sell these credits, thus receiving a direct financial return for their efforts. The primary buyer of ACCUs at the moment is the government, via its Emissions Reduction Fund. Farmers (individually or as collectives) who want to embark on carbon farming projects are asked to nominate a price they would need to make it profitable for them to go ahead with the project. Through a reverse auction, the fund selects the lowest-price proposals. Explainer: how does today’s Direct Action reverse auction work? In this way, the government gets the greatest carbon abatement for the least money. Successful bidders embark on their projects knowing that they have a guaranteed price for their carbon abatement outcomes. There is nothing magical or mystical about it. It is simply the price at which the buyer and sellers of carbon credits find it mutually advantageous to do business. The average price paid at the last auction round was A$12 per tonne of CO₂ abated. This is the current carbon price in this particular market. A second potential set of buyers of carbon credits was created by the Safeguard Mechanism, introduced by the Abbott government. This caps emissions from big industrial emitters in order to to ensure that abatement achieved by the ERF is not offset or cancelled out. The cap is set at whatever the maximum emission rate from the emitter has been. So it is not designed to reduce emissions from these big emitters, but simply to hold them to current levels. The scheme covers just over 150 facilities, which are responsible for about half of Australia’s emissions. Emitters that go over their limit can remain in compliance by buying enough carbon credits to compensate for their “excess” emissions and surrendering these to government. BHP Billiton Mitsubishi Coal/BM Alliance. These companies bought their credits from carbon farmers who abated more carbon then they had calculated, and so had a surplus left over for sale. But what is most interesting is the price that excess emitters were willing to pay for the surplus credits. Most of the sales were in the region of $14-15 per tonne (T), but the price rose to $17-18/T as the deadline approached. This means that the price spiked at 50% higher than the most recent ERF auction price of $12/T. Commentators describe this as a secondary market, and the price in this market is exciting news for carbon farmers. According to Australian Carbon Market Institute CEO Peter Castellas, “Australia now has a functioning carbon market.” Carbon farmers – who make up an increasing proportion of the Nationals’ constituency – will do well if this market expands. One way to develop the market would be to slowly lower the caps on big emitters so they must either buy more carbon credits or find ways to reduce their own emissions. From this point of view, there is good reason to progressively and predictably reduce the emissions allowed under the Safeguard Mechanism. Here’s where we get to the current review. As already noted, the Safeguard Mechanism does not seek to reduce emissions from big emitters. In fact, it allows for an increase in emissions to accommodate business growth. Nevertheless, big emitters are still unhappy. The government’s review is a response to business concerns. An initial consultation paper has proposed making it easier to raise the cap on a company’s emissions as its activity grows. If the rules are altered in this way, the demand for carbon credits may stall, and even decline, bringing to an end to this promising new source of revenue for farmers. That is why members of parliament with rural constituencies should take note. Rural MPs should not sit by and allow the government to respond to the interests of the coal industry and other lobby groups. Carbon farming depends on reducing the caps under the Safeguard Mechanism, not raising them. This would also be a step in the direction of achieving the emissions reduction target to which Australia agreed at the Paris meetings in 2015. Eliminating trade barriers on green technologies could help countries to shift away from fossil fuels. Border tax adjustments, or BTAs, refer to import taxes on goods from countries where companies do not have to pay for their emissions. This is highly controversial and problematic for practical reasons and difficult to reconcile with World Trade Organisation (WTO) compliance requirements. The arguments in favour rest on punishing free riders and protecting the competitiveness of national firms subject to climate change costs in their home country. Such taxes are also held up as a way of avoiding “carbon leakage” caused by production shifting to countries with more lax climate change policies. The latter two arguments are similar to those that have been applied in the past to environmental protection regulations. The problem with them is that there is very poor empirical evidence for either competitiveness risk or for carbon leakage. They also rest on the assumption that combating climate change is always a net cost. This is being increasingly challenged. The argument against BTAs centres on the potential of unilateral measures being used to coerce developing countries. The sensitivity of such measures is shown by the fact that, until very late in the negotiations of the Paris Agreement, developing countries insisted on including the following clause. 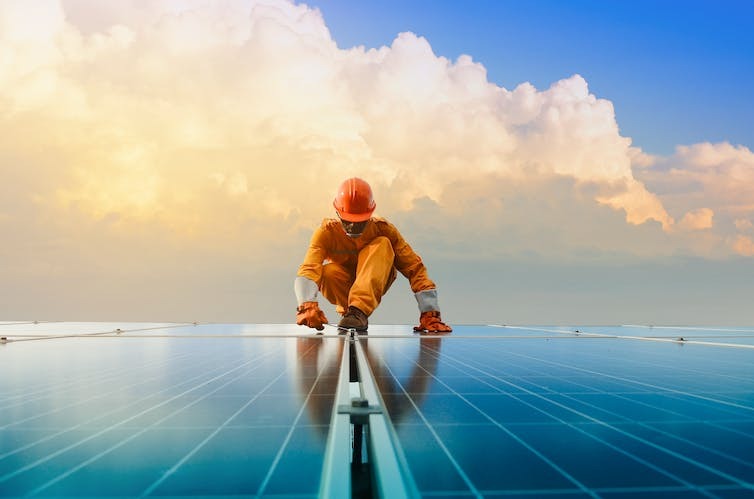 Eliminating trade barriers on solar panels and other green technologies could help countries to shift away from fossil fuels. This is fully within the scope of the WTO and indeed the mandate of the current Doha trade round. There are several work streams within the WTO covering this area, though progress is slow. The Kyoto Protocol includes several mechanisms (Clean Development Mechanism, Joint Implementation and Emissions Trading) that can be used by countries that have tabled a 2020 target (European countries and Australia). International market mechanisms beyond 2020 have not yet been created under the Paris Agreement but its Article 6 foresees them. Such mechanisms are being developed bottom-up by groups of countries, which can make much faster progress than is possible within the United Nations Framework Convention on Climate Change (UNFCCC). However, any new mechanisms are likely to be linked in some way to the UNFCCC. There is no coverage of carbon trading under the WTO at present and there appears to be no appetite for bringing it within WTO disciplines. One fear is that WTO rules will have a chilling effect on climate change measures such as subsidies, technical regulations or bans on certain products. However, Article 3.5 of the UNFCCC (which applies to the Paris Agreement as it does to the earlier Kyoto Protocol) is clear. It uses WTO language to state that “measures taken to combat climate change, including unilateral ones, should not constitute a means of arbitrary or unjustifiable discrimination or a disguised restriction on international trade”. The UNFCCC, like the WTO, acknowledges the legitimate purpose of climate measures, including that they may involve restrictions on trade. There is ample and growing WTO jurisprudence on measures taken for environmental purposes which confirms their legitimacy in WTO law. The jurisprudence is not static; it evolves with international thinking as expressed in treaties and less formal agreements. Helpfully the WTO Treaty (1994) included an objective relating to protection and preservation of the environment that went further than the earlier General Agreement on Tariffs and Trade (GATT). This provision has already been used in interpretation by the highest WTO jurisdiction, the Appellate Body. I expect that some carbon markets will develop amongst carbon clubs. Trading rules will be determined by those countries involved and will rest on the environmental integrity of the units traded. Border tax adjustments (BTAs) are problematic. Some commentators have predicted a climate change trade war, arguing that countries are vulnerable if their climate measures are seen as inadequate. This is now an improbable scenario. Any attempt to impose BTAs against countries which have signed up to the Paris Agreement would face enormous practical difficulties. It would also risk undoing the international consensus. Transparency, peer review and naming and shaming of countries with inadequate pledges (Nationally Determined Contribution or NDCs), or countries that fail to implement an adequate one, may prove more effective than any of these unilateral measures. Evidence from the climate change negotiations is that countries do care about their reputation. A further resource to encourage countries to act would be carbon clubs, where countries wanting to accelerate their transition to a low-carbon economy would link their climate measures through a common carbon price via their emissions trading schemes. The threat of BTAs – clearly foreseen by major American companies after the Trump Administration’s decision to leave the Paris Agreement – may be a useful political lever to gain cooperation. But there are other ways of achieving similar ends. One example is to require all goods, domestic or imported, to meet sustainability standards. This is potentially allowable under the WTO Technical Barriers to Trade agreement (TBT) as a type of processing and production method. But even if not, the existence of the Paris Agreement – a universal agreement with clear objectives and requirements on all parties to act on climate change – would be a useful reference in any dispute settlement proceedings. The link below is to an article reporting on a pledge by the USA to support efforts to combat illegal wildlife trafficking in Africa.